Hostinger is a web hosting company who was founded in 2004. With almost 30 million customer across nearly 200 countries, Hostinger aims to constantly improve their services for you! Hostinger have around 15,000 (yes, that’s fifteen thousand) sign ups every day. They’ve become a real contender in the web hosting market, allowing their customers complete freedom when it comes to creating a website. Hostinger has grown rapidly over the years, which is one of the reasons I wanted to review this web host. The company boasts lots of interesting and exciting features, with a wide variety of unlimited options. I wanted to see if these features were really as good as they sounded by signing up to their shared web hosting. Hostinger have a real connection with their users. Their social media pages are full of actual photos, information, and customer engagement. It’s so refreshing to come across a company that doesn’t hide behind their ‘four walls’. Their Twitter feed shows some positive reactions from current users. What I really respect about Hostinger is that they publicly display their server status. They list all of their available servers and show their customers (and potential customers) if there’s been any downtime and how long this went on for. The page regularly refreshes to keep those interested up to date. In fairness, the majority of their servers boast a 100% uptime record. However, some have fallen a little short, but Hostinger don’t hide this. You can see how long each server has been up (or down), and view the history of each server too. What’s more, if you’re interested (which I was), you can click on each individual server to learn more. Here you’ll find data for the last 7 days, including the reason why there was any downtime, as well as the average response time. For me this shows just how transparent Hostinger are. They aren’t afraid to hide their stats, and are even willing to let customers see the full details of any outages. I know this sounds a bit mad, but I’d be tempted to choose Hostinger based on this, even though they only guarantee a 99.9% uptime (rather than 99.99%). Hostinger pride themselves on offering a 99.9% uptime guarantee. It may only be 0.01% of a difference, but quite a few others hosts do offer 99.99%. I wanted to see for myself how my website stood up. I was keen to know if I were to host my website on a permanent basis with Hostinger, would I experience much downtime? The results were in! In the last 24 hours my website hosted with Hostinger experienced zero downtime. However, across the last 7 days the uptime was recorded at 99.93% and over the space of a month (30 days) it was 99.98%. To be fair, the uptime was quite good! Not as good as other hosts like SiteGround, but it’s not something to stick your nose up at either. All in all, I was quite happy with the results from my uptime tests. It’s vital for any kind of website to promote fast loading times. No one wants to visit a site that takes ages to load, so yours shouldn’t fall short either. I’m sure you can remember a time where you’ve been waiting for a website to load and have eventually abandoned it. On average, if a website takes longer than 3 seconds to load, people will start losing interest. In fact, almost half (40%) of people will abandon a site if it doesn’t load quickly. Not only will this affect visitors to your website, it will damage your SEO score too. Hostinger has web hosting servers in the U.K., U.S.A., and Asia. According to Hostinger, these servers are on a 1000 Mbps connection speed to adhere to their loading time SLAs. Naturally, I wanted to check this out for myself and see how long it took for my unoptimised website to load. The industry standard website load time is just under 900 ms. I was pleased that my website loading in just 263 ms without any kind of optimisation. A standard WordPres install via Hostinger’s cPanel produced a performance grade of 87 (grade B) without me having to do anything! Customer service can often be the deciding point as to whether to sign up to a web host or not. Thankfully, Hostinger didn’t disappoint on this front and I’m going to tell you all about why their customer service is incredible. In their 2018 roundup, Hostinger introduced Intercom (an instant messaging system for companies). Hostinger always listen to their customers and implement improvements and new features to resolve any issues. You can contact Hostinger via post, support ticket, or live chat. One of the only downfalls of their customer service is that you can only use the live chat if you’ve signed up to Hostinger and logged in. Not really a major issue, but I guess if you have pre-sale questions, a live chat service could be very beneficial. When I tested Hostinger’s live chat system, I did so at around 7PM (GMT) when I figured their service may be at it’s busiest. I was really surprised to connect to an agent in less than 1 minute! Once the chat was conected, the support agent started typing and the conversation was underway almost immediately. The support agent was polite, friendly, and most of all, helpful. His knowledge was astounding and it seemed like he actually cared about the company and it’s customers. Getting in touch with Hostinger just requires you to select ‘Contact Us‘ at the bottom of their site (really easy to navigate to). My aim for these hosting reviews is to give you accurate and technical information about web hosts like Hostinger. Whilst all of this is useful, I understand that some people just want a quick overview of what’s good and bad (or could be improved). So far, I’ve found Hostinger to be a really good contender in the hosting market. They offer a lot, and create affordable web hosting opportunities for many users. Based on my experience, I’m going to outline all the things I love, and the things I don’t like as much, about Hostinger. This should give you a clearer picture about this web host and allow you to make your own decision about them. Included with all of Hostinger’s web hosting plans is their free website builder. Whilst it’s not as good as the individual website builders in that specific market, it’s definitely worth a mention (especially as it’s free). There’s lots of interesting templates to choose from, so if you’re stuck for ideas, take some inspiration from Hostinger. The templates look modern and professional and can be edited in any way you like. Their custom developed website builder tool means that you don’t need any coding knowledge. If you want to create a website from scratch with drag and drop functionality, it’s all available at your fingertips with Hostinger’s web hosting plans. Free domains are included with Hostinger’s Premium and Business plans. I’ll go into more detail about this later on when I cover each of Hostinger’s plans, in-depth. This is also something that may crop up in my cons section, because you don’t get a free domain on the Single plan. Hostinger’s interface is clean, modern, and easy to use. Anything you might need during your web hosting journey is located all in one place. 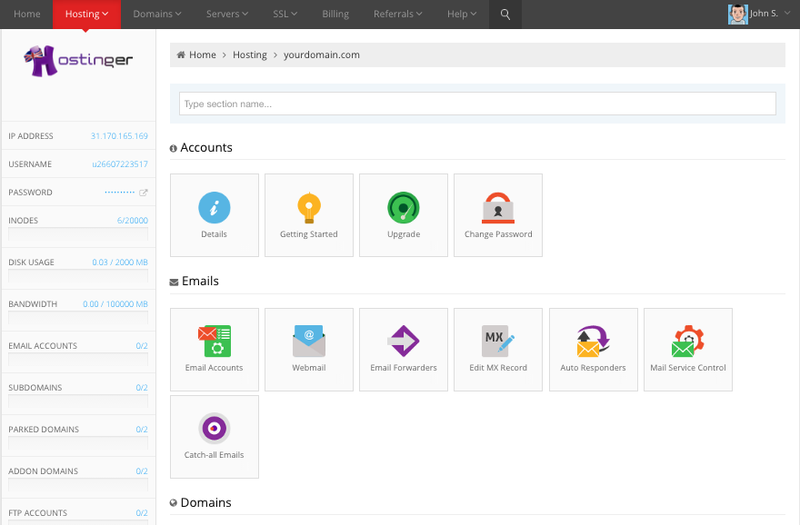 You can monitor and track your logins, billing information, emails, website statistics, 1-click installs, and domains all from your Hostinger dashboard. Their own version of cPanel is just as easy to get the hang of. In fact, it may even be easier to use; all of the icons are large enough to read and everything is labelled simply. If you’ve never used a control panel before, I have no doubts that you’ll be able to pick Hostinger’s up with immense ease. When you sign up to Hostinger’s Premium or Business plans, you’ll get unlimited email accounts (absolutely free). These are all managed through the simple control panel that I showed you above. You can manage all of your email accounts in one place. This also covers spam filters, your email usage, and… well, anything email related to be honest! It’s really easy to set up email auto responses, forward emails, and enable/disable accounts if you have more than one. As I mentioned in the Customer Support section of my review, live chat is only available if you’re logged in. You’ll need a Hostinger account to do this, so if you’re not a customer, you can’t make use of live chat. This is frustrating for me (and I’m sure others), because if you have pre-sales questions, you can’t ask them quickly. This may put potential customers off from signing up to Hostinger. I’m pleased that live chat is available if you’re a customer, but it would be nice if the web host changed this to be available to all users sometime in the future. Again, I previously mentioned this little niggle I have with Hostinger. You only get a free domain when you sign up to the Premium or Business plans, so customers wanting the cheapest plan don’t get this bonus. This is probably just me being really picky, but if you do pick a plan with a free domain, you only get 1 domain and any further registrations are at a cost. On the plus side, domain registration with Hostinger (for a year) isn’t exactly going to break the bank. In fact, for a web host, I think their prices are very reasonable! Often web hosts aren’t very competitive when it comes to domains, but Hostinger certainly competes in this area. Now that we’ve explored Hostinger’s good and bad points, and checked out some of their features, I want to look at their shared hosting plans in more detail. 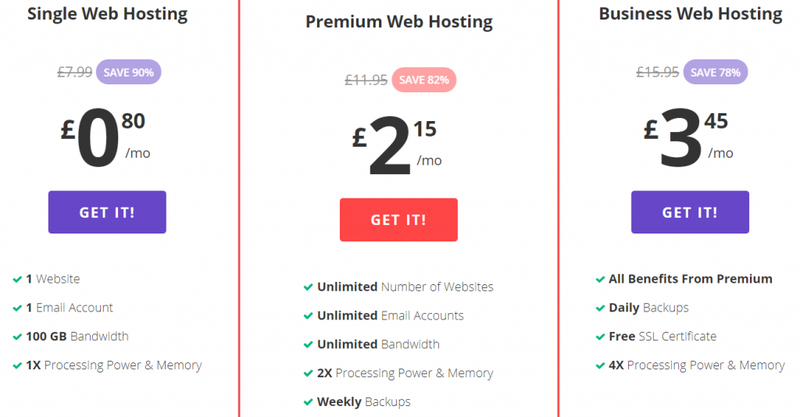 Price isn’t everything when it comes to web hosting (yes, affordable is nice) – there’s actually a lot to consider. Yes, you’re seeing the price correctly, 80p (pence!!) per month for web hosting. That’s incredibly affordable, but this is based on a 48 month plan. It does annoy me when web hosts advertise their monthly costs based on a long-term contract, but still, that’s just over £38 for the term. You’ll also benefit from 10GB SSD storage, 1 MySQL database, and a free website builder. If you were to look at this plan without knowing the price, you may think it’s slim pickings. However, when you consider that’s £38 for 2 years, this is a perfect plan for a startup blog or website. You really can’t go wrong at £0.80 per month, and you’ll get all the benefits of Hostinger’s good uptime record and response times. Hostinger’s premium plan is over double the price of the single plan at £2.15 per month. Still, that’s not exactly un-affordable, especially when you look at the additional features that are included. Your SSD storage gets doubled to 20GB, you’ll have unlimited MySQL databases, and you get a free domain. This plan is great for those who want more than the single plan, but don’t want to pay out for features they won’t use. The storage space isn’t the best I’ve seen, but it is on an SSD and most websites won’t exceed 5GB anyway! Your storage space will increase to 30GB and all of Hostinger’s features are included in this plan. It only costs just over £1 more than the Premium plan. I think it’s worth spending the extra quid just to get access to everything. Do I Recommend Hostinger Hosting? After reviewing Hostinger, most definitely YES! Hostinger is incredibly affordable, starting from just 80p per month! Hostinger’s performance records were solid when I reviewed them, and I think they’re a suitable choice for many users. Their uptime could do with a little improvement, but then again they only guarantee 99.9% uptime, and history shows they always achieve that. If you’re worried about it, they publicly display any downtime or outages they’ve experienced (or are experiencing) on their servers. Whilst their entry level plan doesn’t offer a whole lot, their Premium and Business plans do. This is all at the cost of the price of a sandwich, so finding reasons to complain is really quite difficult! 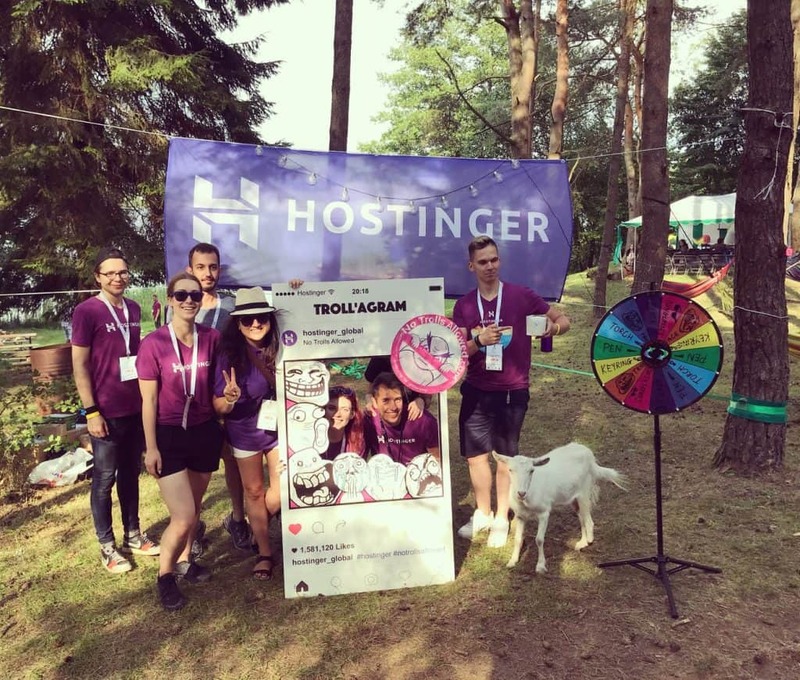 If you’re looking for a web host that offers fantastic web hosting, good website speeds, and incredible customer service, Hostinger would probably be the right choice for you!